Rendez-vous au parc d'aventure écologique Selva Maya à Tulum à l'heure de départ choisie, le matin ou l'après-midi. À votre arrivée, rencontrez votre guide et votre groupe et commencez votre aventure. Montez à bord d'un véhicule tout terrain pour un trajet de 3,8 km (4,8 km) jusqu'à la base de tyrolienne dans la jungle, où vous vous équiperez avec un harnais et un casque et assistez à un bref exposé sur la sécurité. Ensuite, descendez une série de neuf tyroliennes et cinq ponts suspendus traversant la canopée. Continuez votre aventure en escaladant une pyramide d'escalade de 18 mètres de haut (5,4 mètres); descendre de l'autre côté en rappelant un cenote. Une fois au sol, enfilez un masque de plongée et un gilet de sauvetage pour profiter de deux cénotes: un cénote semi-ouvert permettant de vous détendre ou de sauter d'une falaise, et un cénote de caverne où vous pourrez faire de la plongée pour voir des stalactites et des stalagmites. De petits groupes de cinq personnes maximum à la fois protègent le cenote et offrent une expérience plus naturelle. Complétez votre visite avec un déjeuner maya comprenant du riz, des tacos au poulet, des tacos au porc effiloché, des salsas et une bière ou un soda. Retournez à l'entrée du parc à la fin de votre visite. This excursion is sooooo worth it!!!!! The ziplines are awesome! The staff is great! 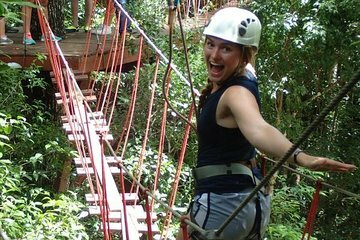 The hanging bridges are fun and the cenotes are INCREDIBLE! The food following the activities is also actually really good! Great excursion all around! I was skeptical this was worth the price but it definitely was. My family was 4 people, and there were two other groups of two in our tour group. So there was 8 of us, and I counted 5 guides helping us! The zip lines were super fun, but also easy enough for my 6 year old to do. The guides said that they had kids as young as 3 do it - but the kids do need to be brave / adventurous. The rock climbing and rappelling was a little lame... yes, we did rock climb and rappel, and it WAS fun, but it was up and down a stone tower - not a natural cliff or anything like that. There were two cenotes, one open to the air and one underground. We had done cenotes before, but not with snorkels and I was amazed to see how much there was to see. The underground cenote was AMAZING. It was nice that there was only the 8 of us, and our guide had us follow him while he shined a light around so that we could see the features. The tacos at the end were good, and the beer that came with it was a nice treat. The bugs were INTENSE, but they gave us bug spray. The ATV ride was also fun. My only complaint is that there weren't any seat belts on the ATV part of the fun so my daughter hit her head on the seat back in front of her, since they didn't warn us to be careful about bracing ourselves against that. She was fine, though, and that was just a small bump in an otherwise great trip. I am always hesitant booking tours but this one more than exceeded my expectations! First off, the guides are incredible. They were entertaining, experienced, and most of all focused on safety every step of the way. We had a larger group that ranged from children to older adults and I think everyone was enjoying themselves every step of the way. The zip lining was well above average and the guides let you know when you could have a little more 'fun' on a certain line. As a bonus, you have to cross suspension type bridges between some platforms that keep you engaged instead of waiting around. The rock climbing was actually more challenging than I imagined but it added to the adventurous nature of the morning. A big highlight for me was the small group snorkeling in the cenotes. Many of the public cenotes are overly crowded and detract from the beauty but this was private no more than 5-8 ppl in the water and they let you explore at your pace. The cenotes were gorgeous and exceeded my expectations. On a final note, when leaving the tour we asked one of the guides if there was a better option to get back into the city besides a cab. They let us know a bus drives down the highway every once in awhile that is much much cheaper than a cab. HOWEVER one of the guides then waited with us roadside for 10-15min! until the bus came so he could make sure we got on the right one. That is above and beyond in my book. All in all I would highly recommend this tour to anyone visiting Tulum. It captures many of the highlights of Tulum and is a fun adventurous way to start your morning I would recommend the morning to avoid the heat!. Great excursion! Raoul was a fabulous guide - relaxed, patient, competent and entertaining. Safety was top priority, the ziplines were awesome. Our group was aged 20 - 50 and the course was a nice balance of challenging but not too challenging for everyone. Beautiful cenote visits at the end of the tour and a simple but fabulous lunch in the forest. Love the homemade bush buggy they use to transport people in and out of the excursion! Its a bit of a rough ride but nothing to worry about and for me just added to experience. We did the morning tour and glad we did - it gets hot in the jungle, even in the morning. Its about 11km south of Bahia Principe.Really easy to get to via colectivo but make sure the driver knows it is SELVA Maya, there is a similarly named place that he tried to drop us at. Highly recommended - do it! This was a great tour. Fairly easy to find off main 307 Highway. Fun trip to the zip lines. We were transported from the entrance to the start of the zip lines for 4 miles in old Mercedes Army Transport Truck -a Mayan Roller Coaster for about 20 minutes there and at the end of the trip. All the tour guides were very friendly, learning your name, and very safety oriented. Zip lines were fun, snorkeling was amazing the in the cenotes, that were are part of the path used when discovering all the connections to Dos Ojos, for the world's largest cave. The pork and chicken tacos at the end were delicious. Make sure you bring money to tip the guides at the end of the trip - they deserved it! This Eco park is a fantastic choice! We had a lot of fun, but also felt very safe with the fantastic staff! One of the best afternoons EVER! Began with a fun ride out to base--followed by long zip lines/bridges through the canopy. Highlight was snorkeling over stalagmites in the underground cenote Celestial, and doing cannonballs into cenote Bonita. Raoul and Vicente were FANTASTIC guides, giving you just the right amount of direction and encouragement if needed. Never felt rushed, and even had free time to swim before our vegan accommodated tacos--yum! Out of the 4 tours we did in Tulum, this was the best. A lot of fun and beautiful cenotes. This was our first tour in Tulum and it was a great experience! Our guide was hilarious and full of energy. The cenotes both open and closed were beautiful and fun to swim in. They were particularly concerned that we got all the pictures we wanted, snapping photos of us on the zipline, in the cenotes etc. The lunch was great. The only downside was, I was expecting the ziplines to be a bit higher and for there to be more rappelling/climbing. I would highly recommend this trip for beginners/intermediate. Also, there was a multi-generation family with us, everyone loved the ziplines, from the 8 year old's to the grandmother.